Hi, my name is Ian and i would like to share with you and your guests the story about my Lemon water experience. My Cortijo is about 5km from any roads or tarmac and when you are there it feels like you have gone back in time 100 years. The "age of the Donkey" i call it as the local Spanish use this amazing animal for just about everything. 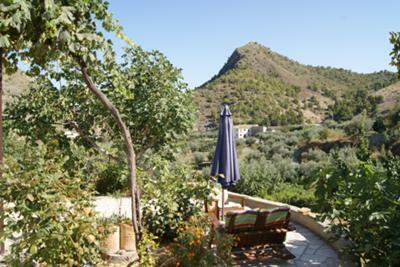 It is not uncommon to see a huge heap of recently cut olive branches moving up the mountain tracks with a little donkey just visible beneath it all. In my garden i grow Oranges, Pommegranite, Almonds, Olives, Figs, Grapes, Peaches, Limes and Lemons. However, most of the time i don't bother collecting all the fruit, until one day. I was alone, Brit my fiance had gone back to Norway. I had slipped and broke my foot in three places. I didn't go to the hospital as Anna, my 84-year old neighbor, bandaged me up with vinegar and brown paper and some bandage. The swelling went down but i was looking at 6 weeks of inactivity. I decided, as i couldn't get to the shops, to use the fruit from the garden as food. So i set out my menu. In the morning before anything else i would drink 2 glasses of freshly squeezed lemon juice mixed 50/50 with warm water. Next i would eat half a pommegranite. Oranges and peaches a little later followed by any of the other fruits little by little (grapes and figs included). Throughout the day i made sure that 2 litres of fresh spring water mixed with a few drops of fresh lemon juice was consumed (again little amounts at a time). I made this my diet for the 6 weeks it took for the bones in my foot to heal. I had lost weight, about 10kg. I was back to 85kg, my fighting weight so to speak. My skin had regained almost all of its good properties, it felt soft, it looked the right color. I seemed to shine with health. My tongue was perfect, a nice clean shade of red/pink and i could taste everything cleanly. My eyes, or the whites of my eyes, were clear, clean and white again. My nails fingers and toes took on that lovely pink shine you see on good healthy nails. I felt and looked the best i had done for years. Of course, the fruits played their part in this transformation but i put it down to lemons and water. Both of them from my garden.